I’ve talked about this before but, once again, my surroundings became the inspiration for what I would wear for the day. Beginning with some floral sneakers (which just happen to match some of my outdoor accessories) I couldn’t resist pulling my orange summer dress out of the closet to help with some gardening. And later I will take these floral sneakers to another level . . .
pairing them with two of my other favorite patterns, stripes and dots. So, my friends, do you get inspriation from your surroundings as well? As always thanks for dropping by. Have a most wonderful day. Join me over at Jennifer and Heather’s for their monthly inspiration and link up party. And Jessica for THT Cherie for her shoe and tell. « SUMMER SHORTS . . . ARE YOU WEARING THEM? This outfit: I am in love! 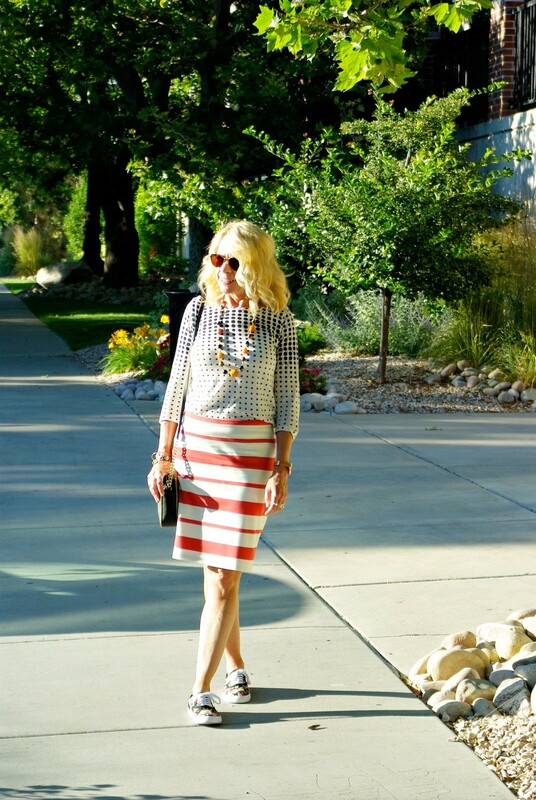 The sassy stripe skirt is so great with the dotted top and floral shoes..how cool is this combo! 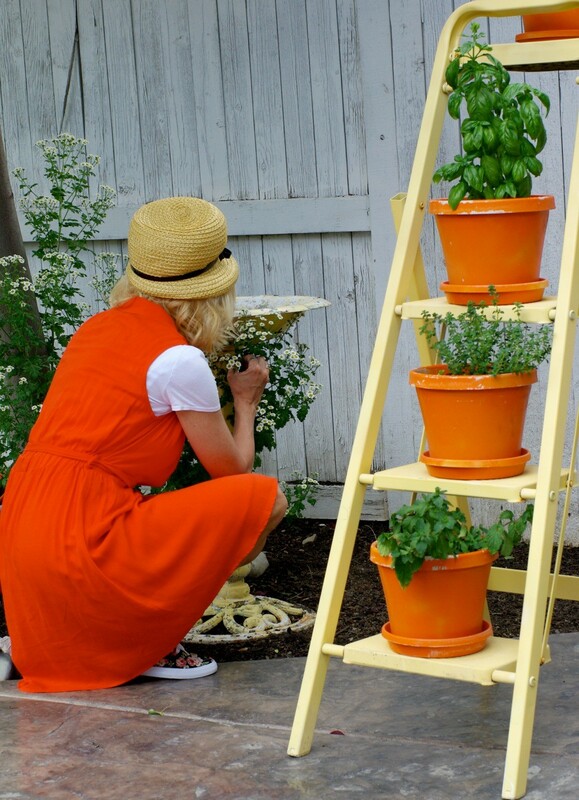 You looked wonderful gardening, too, with the outfit matching the garden pots. We would all do well to let nature inspire us, but you never seen an outside nudge- you just have it! Both outfits are great – you look great in orange! 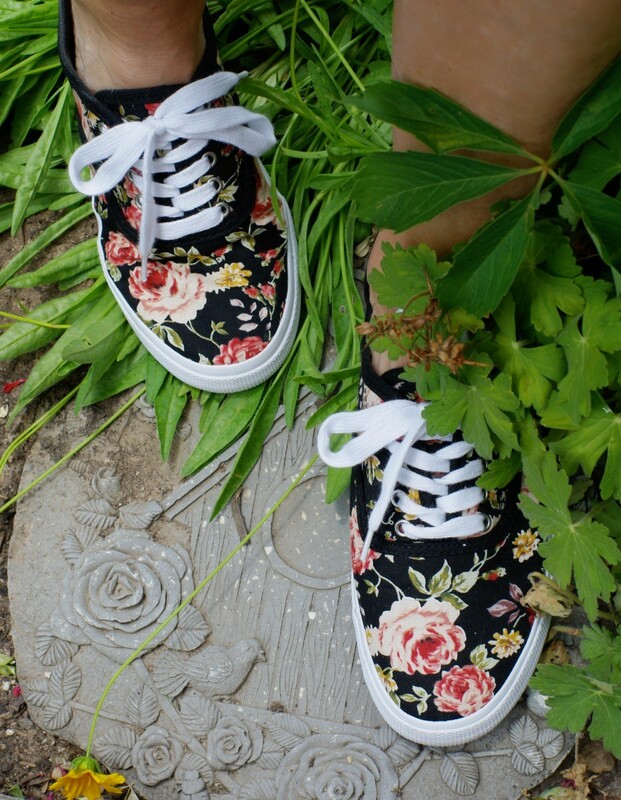 Those floral sneakers are just so fun. Love the orange and oh these sneakers! Enjoyed your visit today too-hope you enjoy the key lime pie. I am in the plain as I write this. 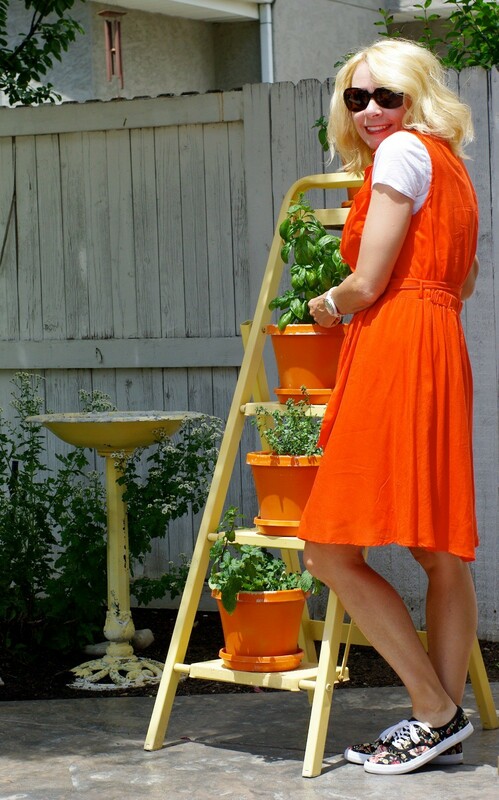 Your flower pots on the ladder are gorgeous. Wearing a dress while potting plants is a new one to me haha. I only put on the dirtiest, oldest stuff on I can find. Or were you only posing near the pots? Sorry… plane not plain. And I ove your outfits. These outfits are both fantastic Trina. I love your floral loafers and own some almost identical so thank you for inspiring me. The orange dress and skirt and top from the second outfit are all beautiful.